When you need an intense hike with some major elevation gain in the Columbia River Gorge, head over to the Rock of Ages Loop Hike. This hike begins at the Horsetail Falls Trailhead which is not far from Multnomah Falls. After a sharp bend in the trail and before hitting Ponytail Falls there'll be a non-maintained entry trail for the Rock of Ages Loop Hike. This hike is not for beginners and should be hiked with caution. 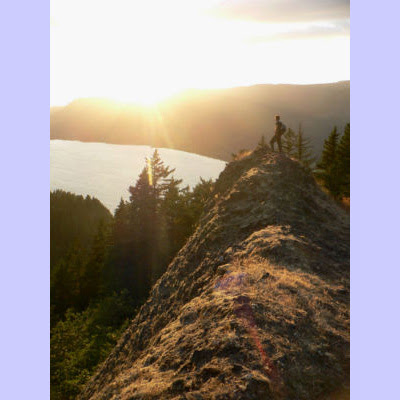 The breath taking views of the Columbia River Gorge will be well worth your efforts. Learn details about this trail below. Rock of Ages and Saint Peter's Dome are two large rock formations standing like Roman soldiers guarding Yeon Mountain in the Columbia River Gorge. While there is no well-worn trail down to either of the formations themselves, the Rock of Ages hike offers some unique perspectives these basaltic domes, while taking you to three lesser-known but worthwhile viewpoints in the Gorge. This is a primitive, but well-worn trail along a steep, non-maintained path. Parts of the hike are scrambles with some exposure and hikers should be cautioned in less than optimum weather conditions. At about a 1000ft/mile the first stretch of this hike rivals any in the Gorge in terms of difficulty.